WASHINGTON—Strategists for the Service Employees International Union (SEIU) smell victory in the House of Representatives in 2019 for their $15-an-hour “Living Wage” campaign, but just to be sure, they invested heavily last year in Democrats who are on a key committee. The union contributed more than $335,000 during the 2018 campaign to 25 of the 27 Democrats on the House Committee on Education and the Workforce, according to an analysis of Federal Election Commission (FEC) data by Leonard Robinson III of the Capital Research Center (CRC). 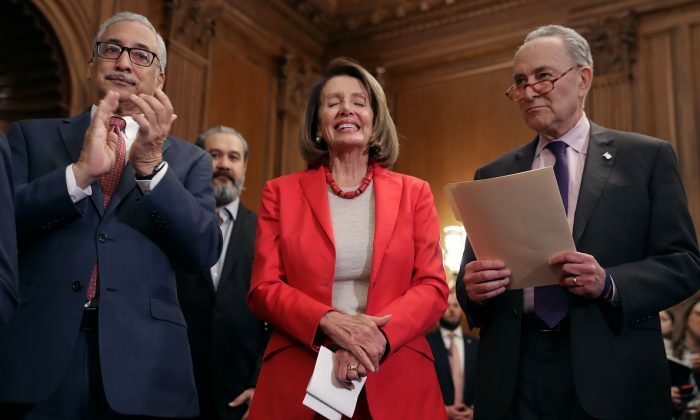 The Democrats’ Raise the Wage Act of 2019 was introduced in the House last week by committee Chairman Rep. Bobby Scott (D-Va.), who got $46,000 from SEIU. Scott was joined by 180 other House Democrats, including Speaker of the House Nancy Pelosi of California and House Majority Leader Steny Hoyer of Maryland, in co-sponsoring the proposal. The bill gradually increases the federal minimum wage to $15 per hour by 2024, from the current $7.25 per hour. The measure would also “index future minimum wage increases to median wage growth” and kills “subminimum wages for tipped workers, youth workers, and workers with disabilities,” according to committee Democrats. The measure also was introduced last week on the Senate side of Congress by Sen. Bernie Sanders (I-Vt.), and 30 other Senate Democrats, including Minority Leader Chuck Schumer (D-N.Y.). Other Democrats on the House panel receiving significant amounts from SEIU include Rep. Raul Grijalva (D-Ariz.), who got $55,000; Rep. Joe Courtney (D-Conn.), who got $47,000; and Rep. Suzanne Bonamici (D-Ore.), with $40,500. Mike Watson of CRC, who worked with Robinson on the SEIU study, noted that Grijalva may have received significantly more than Scott because the latter had no major party opposition in 2018, while the Arizonan did last year and in the 2016 election. Rep. David Trone (D-Md.) and Rep. Gregorio Killi Sablan (D-Northern Marianas) were the only Democrats on the panel who received no contribution from SEIU in 2018. Watson pointed out that the Northern Marianas representative is a non-voting member of the House and that SEIU had endorsed Trone’s Democratic primary opponent in 2018. The union did back Trone in the general election. With 181 House Democrats co-sponsoring the measure, the bill is likely to be approved by the lower chamber with little trouble. Scott plans to move the bill through the committee and report it to the floor as quickly as possible. But the bill is just as likely not to make it through the Republican-controlled Senate, and even if it did, President Donald Trump would veto it. Even so, getting the bill through the House would be an important marker for Democrats, who hope to retake the Senate and the White House in 2020. Doing that requires strong turnout among low-income workers. The CRC’s Robinson estimated that SEIU has spent as much as $90 million on its “Fight for $15” campaign in the past decade, but has gained limited successes. California, New York, and Oregon have adopted versions of the graduated increase, as did the city of Seattle, but Congress hasn’t raised the federal minimum since 2009. Committee member Rep. Pramila Jayapal (D-Wash.), who received $21,643 from SEIU, was a member of the Seattle city council when it adopted the $15 minimum wage. Is Bernie Sanders Selling Snake Oil?